So let us imagine you are a college football coach in a hypothetical universe, and your team is ranked no. 1 in the country, and you are playing the no. 2 team on its home field, late in the season. The game is tied, and you have the ball with a minute and a half to play at roughly your own 30-yard line. Do you sit on the ball and play for overtime, or do you throw underneath, run the hurry-up, mix in a draw or two, and use your timeouts? The answer, unless your hypothetical universe relies heavily on Paul Johnson’s playbook, is almost certainly the latter. The answer is to go aggressive, because in 2013, 75 seconds with an even marginally competent quarterback is a virtual eternity, and because, if you have recruited a decent kicker and not drafted some long-haired punk off the hypothetical soccer team at this hypothetical slacker liberal arts college of yours, you only need to pick up roughly 35-40 yards against what will almost certainly be a soft prevent defense to have a shot at a game-winning field goal. Just last season, Alabama trailed LSU 17-14 when it got the ball back with 1:34 to play. The Crimson Tide had to rely on a struggling quarterback in a run-heavy offense, going against one of the best defenses in the country, with the ball at their own 28; they scored the winning touchdown in 43 seconds. They scored so quickly it almost felt like they did it too fast. And this is the problem Ara Parseghian has faced for the past 50 years in defending the most impactful occupational decision of his career: Modernity has only made it look worse. So now let us imagine it is a different era, and two-platoon football is in its infancy, and there is no such thing as overtime, and your university does not yet accept bowl bids, and anyway, the polls only take into account regular-season games. Your starting quarterback has been flattened by Moses Hightower, and your backup is a 19-year-old recently diagnosed diabetic who appears to have shed most of his stamina and is overthrowing receivers by several feet. Your kicker has attempted five field goals all season, and while he has made four of them, he missed from 41 yards earlier in the quarter; besides, it is the era of straight-ahead kicking, and field goals are a far more dicey proposition. You are undefeated and ranked no. 1, and your opponent is undefeated and ranked no. 2, and this contest is tied at 10-10, and you have one game left to play and your opponent has none. There is one other undefeated team, but you have the advantage over that team, because that team is ranked third. You recognize that if you choose to burn out those last 75 seconds, and then you dispatch a decent-but-not-great Southern California team, you will retain the favor of the pollsters, in large part because you are not the head coach of some hypothetical university: You are the head coach of the Notre Dame Fighting Irish, which is the hypothetical university that millions of urban commuters like to imagine they attended. Let us imagine that you are Ara Parseghian, and it is 1966, and you are involved in yet another iteration of the Game of the Century, perhaps the Gamiest of Them All. Knowing that you may very well win a national championship by doing nothing, do you still choose risk? Since this series is a celebration of college football’s perpetual Argument, I might make the subargument that there has never been (and never will be) a more fascinating and socially fraught iteration of the Argument than in 1966. The preseason no. 1 in the Associated Press poll was all-white Alabama, and the Crimson Tide went 11-0 and finished third in the final poll; the no. 1 team for the early part of the regular season was Michigan State, the first contender ever with more black starters than white, which went 9-0-1, finished second in the final poll behind the team it had tied, and could not play in the Rose Bowl anyway because it had done so the year before; and the no. 1 team for the latter half of the season, the (almost entirely white) Notre Dame, had not yet deemed itself plebeian enough to accept a bowl bid, and clung to that no. 1 ranking in all the major polls, the AP poll and the coaches’ poll and the Football Writers Association of America poll, at season’s end. There is a legitimate case to be made for all three teams, and there is a legitimate case to be made against all three, and looming over everything is politics — both the microcosmic politics of college football itself and the overwhelming racial politics of the era, so much of which was centered on college campuses. When you choose your champions through popular opinion polls, the real world is bound to creep in. Earlier that same year, an all-black Texas Western team defeated an all-white Kentucky team in the NCAA basketball national championship game. It was a stark and straightforward affirmation of the civil rights movement, and no one could accuse Texas Western of being undeserving. But college football had nothing that could compare to it; college football would take another 30 years just to settle on an equitable way to break ties. Which is why there are those who still believe that a segregationist governor had as much to do with determining the national champion in 1966 as Ara Parseghian ever did. That first sentence is nothing but hyperbolic speculation by Dunnavant, who also wrote a Bear Bryant biography and tends to get a little carried away with his advocacy; it’s in the second sentence where things get complicated, and it’s in the second sentence that we exhume the tensions of the civil rights era in the South, and the specter of Wallace, the only person in Alabama whose stature compared with that of Bryant. And so it’s in reading that second sentence that you find yourself faced with a critical question: What are the parameters of the Argument? Should it matter that Alabama was an all-white team in a state where the governor was perhaps the nation’s most outspoken segregationist? If voting against Alabama might even potentially hasten the reversal of a grave injustice, should this be considered? Or should the games themselves be the only things that matter? Bear Bryant confessed a special fondness for his 1966 team, and I’m sure this is partly because he felt they were treated unfairly by the national media, but I imagine it is also because Bryant recognized the headwind he was facing; as the ’60s carried toward their inevitable conclusion, he came to realize that he could no longer win with, in his own words, “skinny white boys.” History has shown, though, that while Bryant’s methods were barbarous, his philosophy was not. He tried to integrate his teams at Kentucky and Texas A&M, and if not for the overarching political stamp of George Wallace, he may have integrated his Crimson Tide teams far sooner than he did. He had already won national championships in 1964 and 1965,2 and the 1966 squad was the last of his great all-white squads: The Tide would not win another Southeastern Conference title until after they had black players on scholarship. You watch highlights of that ’66 Alabama team, and it’s hard to discern the tackles from the backs. I imagine there are fifth-grade teams in Texas with more bulk today. Only two of their offensive linemen weighed more than 200 pounds; when Bryant recruited a 6-foot-6, 280-pound lineman out of Louisville, he immediately put him on a crash diet and asked him to lose 50 pounds. He despised “fat bellies,” according to Dunnavant, and succeeded with blocking schemes that utilized angularity and quickness. But as their rivals swelled in size, this only contributed to the perception that Alabama — as a football program, as a university, as a state — was clinging stubbornly to outmoded values. That November, a few weeks before Notre Dame played Michigan State, George Wallace (who had served out his term limit) managed to get his wife, Lurleen, elected governor. And all of this gave the voters an excuse to demote the Crimson Tide: Before they’d even played a game, they dropped from first to third in the polls. The team that took its place at no. 1 may have been just as apt a representative of the region: Of Michigan State’s 17 black players, 10 were from the South. Twelve of its 22 starters were black, including their quarterback, Jimmy Raye; eight of their defensive starters were black, including Bubba Smith of Beaumont, Texas, who was 6-foot-8 and 285 pounds, wore size-52 extra-long suits, drove an Oldsmobile with his name written in gold letters on the door, and was fast enough to do his sprints with the backs.3 This diversity was fostered by Michigan State’s gregarious head coach, Duffy Daugherty, who scoured the Pacific and the South and even went to Hawaii to find recruits. There were times Bear Bryant (along with other Southern coaches) directed black athletes he couldn’t recruit himself into Daugherty’s hands. In any other sport, this inherent advantage wouldn’t mean anything; the size of Kentucky’s fan base could not aid them against Texas Western, but in college football in 1966, when the media had full control of the most important of all the polls, it afforded Ara Parseghian a distinct political advantage. Since Michigan State and Notre Dame were scheduled to meet in late November, it appeared that this advantage would be rendered moot. Somebody would win, and somebody would lose. If you want to trace the moment when the NCAA began to lose control of its product, you could do worse than pinpointing this particular Game of the Century. Until that Saturday, the television networks had shown one game each week, and each team could appear only once on national TV each season. The policy emerged largely because of Notre Dame: The Irish and the University of Pennsylvania had both aired all their home games in 1950, and fearing a decline in attendance, the NCAA acted in self-defense by regulating the national schedule. And now a decade later, facing widespread protest over the possibility that the Notre Dame–Michigan State game would be aired only in certain regions — a Florida man actually sued the Federal Communications Commission, on grounds that the South, by getting the Kentucky-Tennessee game instead, was being deprived “of top grade college football” — ABC agreed to air it nationally on tape delay. In some ways, I sympathize with Ara Parseghian. He is, by all accounts, a decent and intelligent man who has been forced to repeatedly defend a decision that was pragmatically correct. He’d come to Notre Dame in 1964 and revived it from a moribund period, and he’d become so instantly popular that during a winter storm amid the final home game of his first season, the students chanted, “Ara, stop the snow!” In many ways, head football coach at Notre Dame is a political position. Ara managed the politics as well as anybody, and you cannot blame him or his university for taking advantage of the stature the job afforded him. That’s all he did in the final 75 seconds of the Game of the Century when he chose to sit on the ball. He’d lost his starting center to injury; his quarterback, Coley O’Brien, was not right; he actually did go for it on a fourth-and-short with time running out, just to prevent Michigan State from kicking a last-second field goal. And Duffy Daugherty, facing a fourth-and-4 at his own 36, had chosen to punt back to Notre Dame on the Spartans’ last drive, knowing full well that he might not get the ball back, and knowing full well that Notre Dame had an inherent polling advantage. So maybe we lay too much blame on Ara. Maybe all Ara did was recognize contours of the Argument. Maybe all he did was conform to the system, the way a good coach should. Smith admitted he said these things to exhort his teammates, but he also said them because he believed these things to be true. He believed that Ara Parseghian did the right thing for himself — in part because he is certain the Irish couldn’t have moved the ball against Michigan State’s defense on that final drive, but mostly because Parseghian read the politics correctly, because he crafted an explanation that was both plausible to his supporters and infuriating to his detractors. It is the same explanation Ara uses all these years later. And it’s quotes like these that explain why Ara’s decision, right or wrong, aroused so much emotion: Because he sold it as if it were guided by forces outside of his control (which, you might argue, it was). Because it felt passive, and passivity cut against the grain in this sport. “BAMA PLAYS FOOTBALL; N. DAME PLAYS POLITICS,”4 read one sign at the Sugar Bowl, which Alabama won 34-7 over Nebraska (Notre Dame, following its 51-0 win over USC, stayed home for the bowl season). “I don’t think any other school would have won the championship if they had done that,” Bubba Smith said. And so you had an all-white team complaining that they’d been shut out due to political concerns, and a majority black team complaining that they’d been shut out for the same reasons. And all of this fury began to drive, for the first time, a real argument about the nature of the Argument itself. Soon afterward, Duffy Daugherty floated the possibility of an eight-team playoff; the idea went to a committee, where, like every other anti-Argument possibility floated for the next 45 years, it died a slow and silent death. People were angry at what Ara didn’t do, but even more so, they began to recognize that the system itself had not adapted to modernity — that maybe the Argument itself could not be conducted fairly if everyone came at it with their own biases. Of course, what Ara did was not driven by antiestablishment thought; it was driven by just the opposite. What he did appealed directly to the establishment, which at that point happened to consist of that rarefied group of people who voted in college football polls. 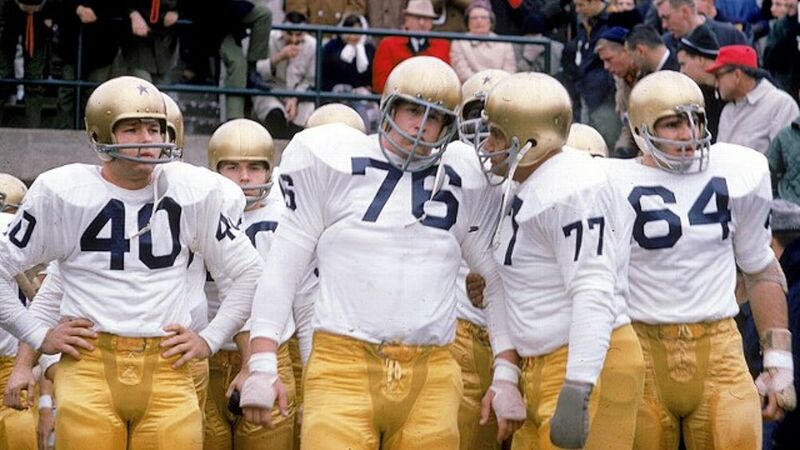 Notre Dame finished first in every poll that mattered in 1966. By playing to his base, Ara won the election. You could make the argument that Alabama was undeserving in either of those previous seasons, but especially in 1964, when the Crimson Tide lost to Texas in the Orange Bowl and no. 2 Arkansas defeated Nebraska in the Cotton Bowl. Of course, bowls weren’t factored in to the national championship picture back then, but this does not stop Alabama fans from affirming that their (equally meaningless) thrashing of Nebraska in the Sugar Bowl validates their claim to the ’66 title. The irony being that, by fielding an all-white team, Bryant was also conforming to political will. Both literally and metaphorically, since Daugherty was apparently no stranger to the racetrack. Well, at least for those who recognized Notre Dame’s lobbying power was affecting the very nature of the sport: In South Bend, they actually burned copies of SI.